Well that didn't take long. EKanoo Racing runs a 7.168 @ 209 mph, and then the Diamonds By Wire Alpha G fires back with a 7.145 @212 mph pass. 6's are coming. We are on the cusp of a 6 second pass, all wheel drive, and unibody. 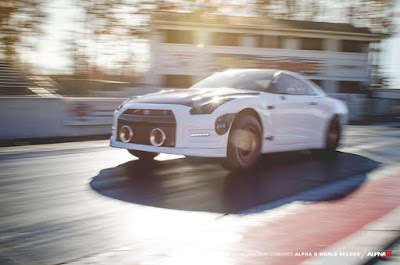 Watch as Gidi Chamdi pilots the Diamonds By Wire Alpha Performance Alpha-G GTR to a New World Record pass of 7.14 @212MPH. AMS Performance traveled to Milan Michigan and brought back the World Record! With still much left Alpha G is far from done.